We are a choir of around 20 people, based in Burnley and led by Janet Russell. We meet on Thursday evenings during school-terms. We sing in three or four part harmony, mainly learning songs by ear, though printed music is often available for those who want it, as are the words of the songs we learn. Some of us don't read music. East Lancs is one of the remaining four Clarion choirs in the UK. We come from a socialist tradition, singing current and historical political songs, as well as folk songs, protest songs, and songs for peace, freedom and justice. 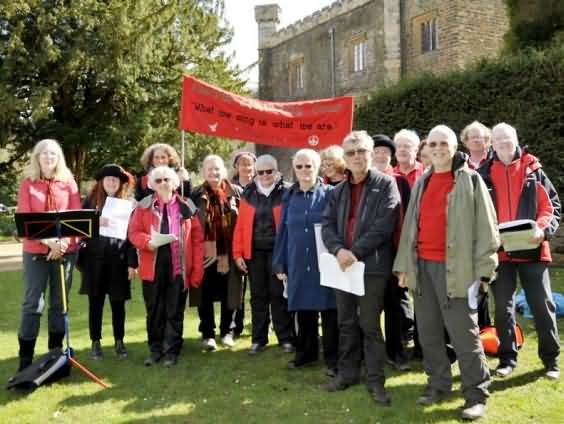 We sing at the Blackstone Edge Gathering (remembering the Chartists), Burnley May Day parade, Nelson Clarion House, at the national Street Choirs Festival, and outside the US eavesdropping base at Menwith Hill. We support local community events and local campaign groups such as the Pendle-Palestine Twinning Group. We are associated with the Campaign Choirs network and support Sing for Water North.